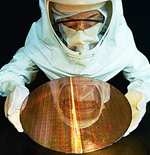 VLSI Standards is excited about supporting your 450mm calibration standard needs! We are currently developing calibration standards in the 450mm wafer format. For instance, as of February 2012, VLSI Standards has developed the capability of depositing both polystyrene latex and silica particles on 450mm silicon wafers. Please feel free to contact us about this new capability or any other 450mm calibration needs. We look forward to fielding your calibration standard requirements for 450mm wafer product versions. Please contact us at (408) 428-1800 or at sales.support@vlsistd.com.